I couldn't have pictured wrapping up the 2016 wedding season in a more perfect way. 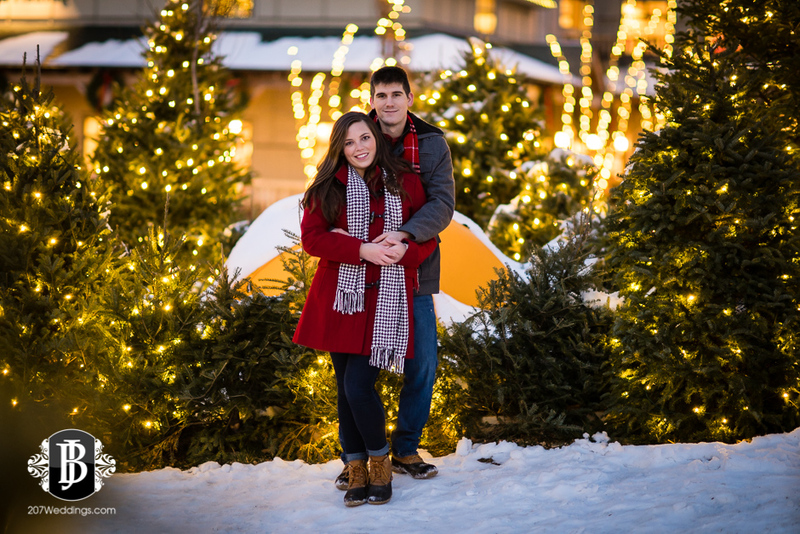 I was super pumped to hear that Ellie and Collin wanted to have their engagement photos done in Freeport, Maine near the LL Bean flagship store. A week earlier I had been to their Northern Lights display that was masterfully designed and executed by none other than The Event Light Pros, and I knew I had to do a photoshoot there. We started before sunset with some shots in front of the store, and made our way around to some of the fabulous buildings lining Main Street and surrounding area, with festive decorations and vibrant colors for days. I haven't shot in Freeport before, but having been numerous times, I knew it wouldn't disappoint. We found everything from a red bard, quintessential Maine house with shutters, to contemporary corrugated metal for a contemporary look, this place seriously has a lot going for it! And at this time of year, everything was decked out for Christmas & the holidays. I mean, this is the most Christmas-y town I am familiar with - and you know how I feel about Christmas. Pure heaven. 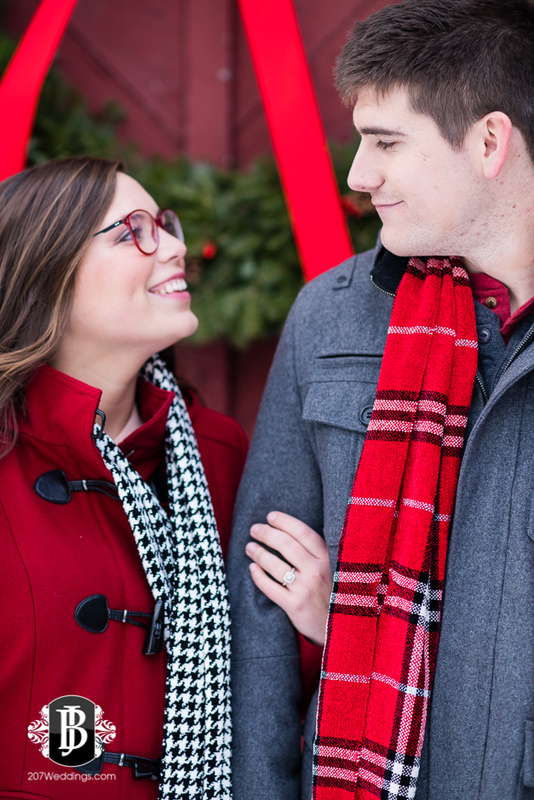 As we made our way around town, each of us decked in our Bean Boots, we had a blast chatting and clicking away among the gorgeous backdrops, all with amazing Christmas music playing through the town. Soon, we came to a beautiful white store front all decked out with evergreen wreaths and swag with the little white Christmas lights, and the sun began to set. Suddenly, the bells of the nearby church began to peel through the Christmas music, and it gave me goosebumps. The sights, the sounds, the crisp air - I could barely contain myself! After sneaking in a couple of more locations before the sun began to dip into the horizon, we found ourselves back at the Northern Lights display, and the adventures continued. 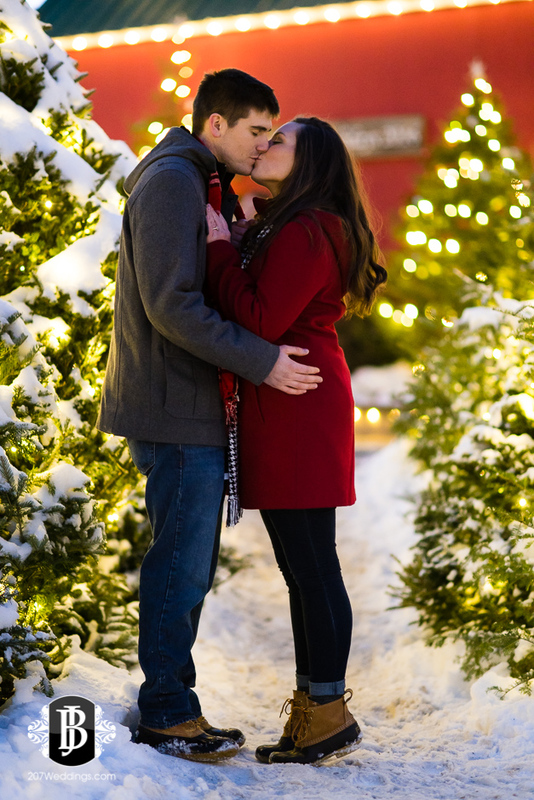 This display was so magical and festive, it truly felt like we were immersed in a magical Christmas forest as we began to get some sweet and romantic shots among this stunning scene. I thought we had made it through the session without anything silly happening, and then suddenly that all changed. After a random visit from a little dog in a sweater who came running out of the Northern Lights dome, and subsequently finding her seemingly disinterested owner, we moved to the other side of the display. With the beautiful trees all around, and the stunning lodge all decked out in the background, I just had to get some shots in. But I couldn't get the best angle that I wanted. So what did I do? I just jumped into the nearest clump of trees and shot through them, of course! What I didn't account for was the fact that the trees were in some kind of a ditch, and so I was in there with them. And I soon came to realize that I was pretty stuck in there, too. Not to worry, I had my trusty Bean Boots, so a little tree-stuffed hill couldn't stop me! So I began to scramble and push my way up the hill through the trees, and all of a sudden, I heard screaming come from the trees right in front of me as I popped through. Well I had just apparently scared the living daylights out of two poor ladies who were taking in the scenery right in front of those trees! Everyone there and nearby erupted into laughter, including me, as I apologized profusely nearly in tears from laughing so hard. They were good sports, and one even exclaimed "I thought there was a Moose or something coming out of the trees!" I'm pretty sure that kept everyone around there laughing for a good five minutes. OH man. Good times. 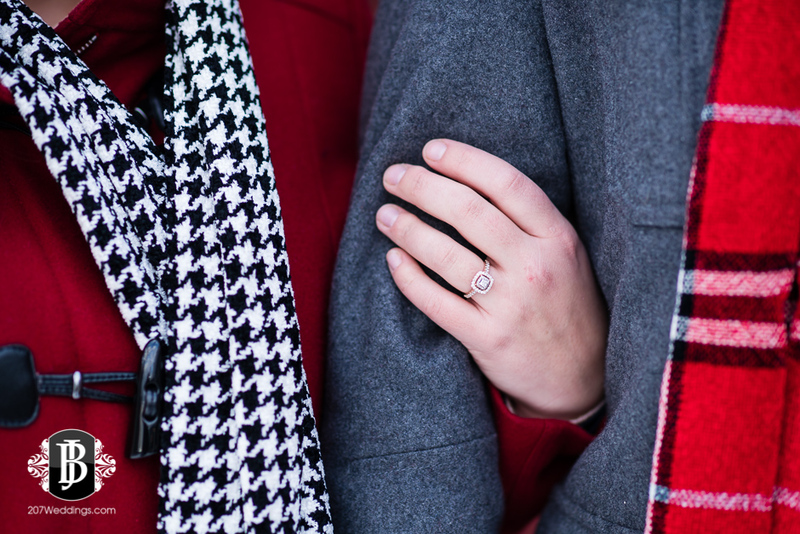 Soon after we composed ourselves, we got in a few more romantic shots in a few more spots before the cold and dark set in and we couldn't feel our fingers and toes. It's usually a good time to stop when my fingers won't move because they are so cold. So our adventure was over, but what a great time it was! 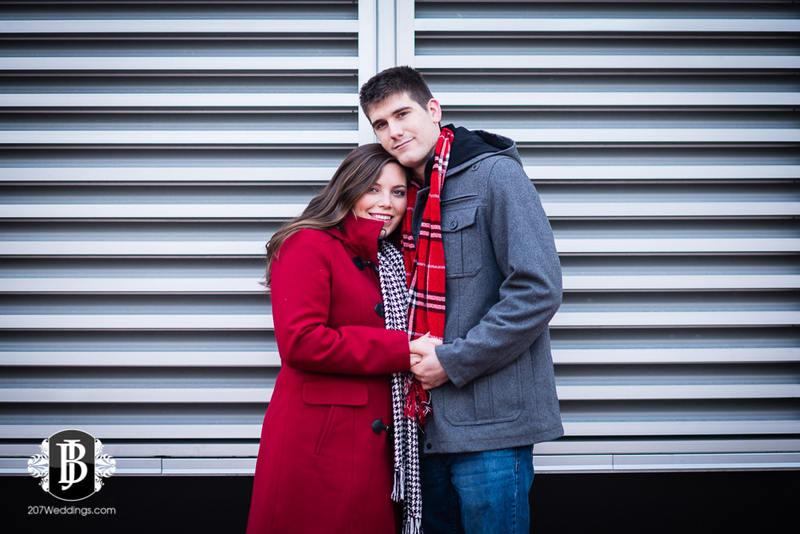 I hope you enjoy these stunning images of this insanely photogenic couple, and enjoy the lingering romantic holiday spirit that they bring as the end of the holidays is near!